The American missile strike that killed many civilians in a Pakistani border village is the latest in a series of failed attempts by the US intelligence and military to eliminate al-Qaeda's top two men. The attack destroyed three houses in Bajaur agency near the Afghan border - with or without the knowledge of Islamabad. It has strengthened the widely-held view in Pakistan that in their sheer desperation to hunt down Osama Bin Laden and Ayman al-Zawahiri the Americans have decided not to care about collateral damage. It's a marked departure from the policy of a few years ago when the fear of civilian deaths discouraged the Americans from bombing suspected Bin Laden hideouts in and around the tribal region. And the new policy certainly means more trouble for Pakistan's military ruler, Gen Pervez Musharraf, who is already perceived by many to be surviving mainly on American life-support. The first indication of trouble came when a couple of pro-government groups joined protest demonstrations to condemn the missile attack on the village of Damadola. Countrywide rallies were as vociferous in their condemnation of the American action as they were of the failure of the Pakistani authorities to prevent it. And, as expected, the criticism of Pakistan's military ruler was not restricted just to the single issue of Friday's missile attack. He was accused of everything under the sun. In some cases there were also demands for him to step down. Much of the fuel for this latest wave of protests was provided by the lack of official details, the friction the incident caused between the American and Pakistani authorities and the mystery that surrounds the place and the people that came under attack. Although the Bajaur tribal agency doesn't have much history of al-Qaeda-linked activities, it has long been regarded as an area where pro-Taleban elements dominate local politics. 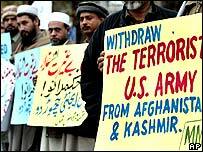 Hundreds of local tribesmen joined a force to fight a so-called jihad (holy war) to defend Afghanistan's Islamic status after the US-led military invasion in 2001. Damadola first attracted the media's attention early last year when the Pakistani security forces raided the house of a firebrand cleric, Maulana Faqir Mohammed, and arrested an Uzbek militant hiding there. This was the first clear indication that some local tribesmen may have links with foreign militants, possibly with al-Qaeda. The missile attack raises new questions, both about US tactics and possible al-Qaeda related activity. In fact, since the attack there have been some strange and contradictory reports emanating from the village. The destroyed houses belonged to local jewellers, who had no history of taking part in religious or tribal politics. Analysts of Pashtun (Pathan) society say such people are not land-owners and do not command the kind of status or respect to invite a militant leader of the stature of Ayman al-Zawahiri for dinner, as some reports have suggested. 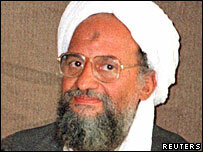 Al-Qaeda watchers say there is a strong possibility that US intelligence made a serious mistake in trying to identify his hideout. However, this still leaves unanswered questions about the al-Qaeda second-in-command's possible visits to this particular village, or Bajaur agency, in the past. But the strangest developments surrounding the attack have been in the form of the death toll, which locals revised downwards from 18 to 13. Eyewitnesses have confirmed that villagers initially dug 18 (at least one account says 20) graves to bury the dead. Later on, bodies of only 13 people (eight men and five women) were brought for burial, and the rest of the empty graves were filled with mud. The explanation given by some local tribesmen is that first they thought that all 20 occupants of the three houses had died, and so as many graves were prepared. But later they discovered that some were not in the house at the time of the attack. Rumours are now going round that at least five of the dead were probably foreigners, and their bodies were taken away by a group of people, before the arrival of the media. If that's true, then no one knows who these people were, and whether they belonged to Zawahiri's band of operatives or were security personnel. The controversy about the Pakistani authorities being aware of the attack has also not gone away. Local Bajaur MP Maulana Haroonur Rasheed insists the Americans took Pakistani intelligence into their confidence before carrying out the missile attack. But despite the controversy, and the street protests, most analysts are convinced that the crisis is not too big for President Musharraf to handle. With nearly 70,000 Pakistani troops deployed to contain foreign militancy in the tribal region, his government's contribution to the so-called war on terror is too big for the Americans to ignore. And the domestic opposition is not powerful or organised enough to launch an anti-Musharraf campaign on this single issue. However, many believe the incident has brought to fore friction between Pakistani and US security agencies over the handling of al-Qaeda related operations in the highly sensitive tribal region. Privately, US officials are believed to be trying to convince Pakistan that the utmost care will be taken in future to avoid civilian casualties. But publicly they have not even admitted having carried out the attack, and are not expected to hand out any guarantees of better behaviour. In such a situation, President Musharraf can only hope that the next American military strike from across the border results in the death of a key al-Qaeda figure, and not civilians. Otherwise, the growing tide of domestic opposition might become quite difficult to control.